When coatings fail it can at best lead to cosmetic problems and at worst lead to product failure. Ensuring the cause of the failure is identified is essential in correcting the problem. In this case study, a top-coat disbondment has occurred from the red primer layer on steel bridge girders used in motorway construction. The photographs show the construction site and close up views of the underside of a girder with catastrophic delamination of the gray top-coat from the red primer layer. ToFSIMS detected that an amine additive migrated from the tie layer to internal interfaces forming a waxy overlayer ("bloom"). This weak interlayer caused subsequent coating disbondment. The spectra obtained confirmed the amine additive presence on a paint flake from the primer side of the failure. The cause of coating failure in this case was incompatibility between the hardener and the moisture in the environment during the curing process. Craters were visible in a melamine-based lacquer coating on a metallised foil. ToF-SIMS was used to analyse a crater with reference to non-cratered lacquer material. The results revealed high levels of caprylate and caprate-based esters of glycerol within the crater. Diagnostic signals for this material include m/z 127+/155+ (CnH2n+1CO+) and m/z 327+/355+/383+ (CnH2n+1C(=O)O-CH2-CH[O(O=C)CnH2n+1]-CH2+) (where n is a mixture of 7 and 9), readily identifiable using the molecular specificity of ToF-SIMS. Glyceride esters can be used in lubricant formulations and the source of this contamination was the coating equipment. Craters and other defects have also been observed in automotive coatings, illustrating the necessity for stringent cleanliness specifications during the painting process. ToF-SIMS is used routinely to investigate these. ToF-SIMS data, acquired within a crater in an automotive coating, showed that a fluorocarbon contaminant had caused localised de-wetting of the surface during paint application, resulting in crater formation. The two-color overlay ToF-SIMS image (below) shows an intense fluorine signal in the de-wetted area (cyan), associated with the fluorocarbon contaminant. Organic species from the paint layer are shown in red. SIMS depth profiling was used to study the failure of beverage can coatings on long term shelf storage. The locus of failure was believed to have occurred at the lacquer coating / can wall interface with a suspected corrosion mechanism involved. 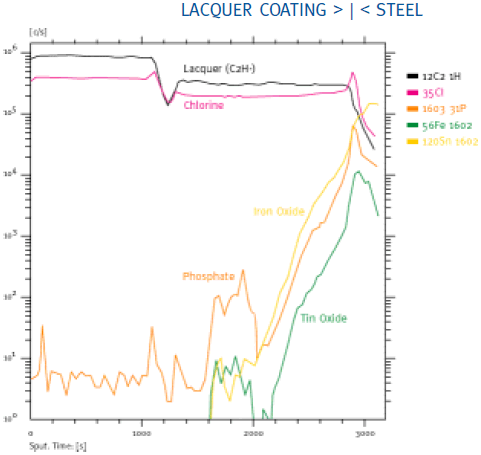 SIMS profiles through the lacquer coating and into the steel can substrate revealed the presence of high levels of chlorine at the lacquer/steel interface on cans with poor long-term performance (see below). In contrast, good cans had relatively low levels of chlorine present. In combination with other analyses, the results revealed a corrosion mechanism involving transport of chlorine to potential corrosion sites during storage.